The state’s wine industry had an impact of $4.8 billion in 2013, up 37.1% from $3.5 billion in 2009, according to a study prepared by the Seattle consulting firm Community Attributes Inc. and vetted by William Beyers, a professor emeritus at the University of Washington known for his influential work in economic analysis. 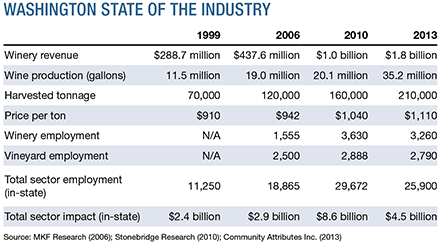 The direct business revenues underpinning those impacts increased 39.6 % to $2.4 billion in 2013 from $1.7 billion in 2009. “They’re awesome news,” said Steve Warner, president and CEO of the wine commission. Comparisons with the numbers presented in the previous three analyses of the industry’s impact on the state’s economy are difficult, if not impossible, thanks to the different methodologies each author used. However, the industry’s growth is hard to dispute. “For me, the focus is the growth; the focus are the trends. The numbers are fantastic,” Warner told Wines & Vines. A study MKF Research of St. Helena, Calif., prepared for the commission using data from 2006 pegged the impact of the state’s 437 wineries that year at $3 billion. The new study includes approximately 800 wineries and pegs their impact in 2013 at $4.5 billion. Yet the amount is approximately half the stunning $8.6 billion figure that Stonebridge Research of Napa, Calif., attributed to the sector in 2012 using 2010 data (see “Washington Wine’s Economic Impact”). Warner, who at the time described the Stonebridge report as “a baseline” for the sector, said the latest report does the same thing—but with the added benefit of having been peer-reviewed. Stonebridge principal Barbara Insel explained to Wines & Vines in 2012 that her firm’s report tapped a wide range of information—“tracking down supplier by supplier, industry, sub-industry, related sector”—to provide a comprehensive picture of the industry’s contribution not only to the economy of Washington state but also the nation. Ste. Michelle Wine Estates contributed in-kind assistance in the form of workers who helped contact growers, wineries and more than 200 industry suppliers. Ste. Michelle also assisted with the current study, but CAI senior economist Spencer Cohen said a different methodology than that used in the Stonebridge report made his firm’s report a more accurate document. Discrepancies between the two reports are most evident in the estimated impact of the sector, but also include more concrete matters such as winery visits and employment. Stonebridge estimated approximately 2.4 million winery visits in 2010, while the current study suggests that winery visits totalled just 2.1 million in 2013. Similarly, employment at wineries and vineyards is down by a few hundred people—though it should be up, as the previous report calculated full-time equivalent (FTE) positions whereas CAI counted each job—full-time or part-time—as one position. Insel said differences in methodology will occur, but so long as a report is comprehensive and transparent in its methods and data, readers can assess individual reports on their own merits. Responding to Cohen’s charge of double-counting, Insel said less vertical integration in the Washington wine industry demands an approach that takes into account both grape production and wine production, which are complementary but separate businesses. While the discrepancies may raise eyebrows, Cohen said CAI crunched 2009 data to enable direct comparisons within its own report. For example, total wine industry employment rose from 18,700 in 2009 to 25,900 in 2013, according to the numbers and methodology CAI worked with—a 38.5 % increase, consistent with the sector’s own growth. One point that both the current report and the previous one agree on, however, is that winery revenues are increasing, from approximately $1 billion to $1.5 billion.